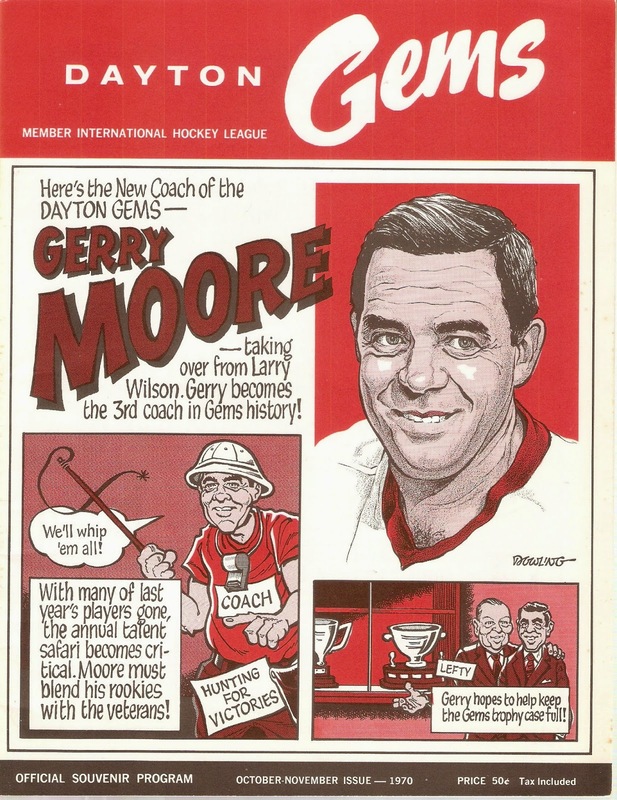 After the 1970 Turner Cup win, Wilson stepped down as coach and was replaced by Gems winger Gerry Moore. Moore's first Gems squad finished in third place in the IHL, with a 36-29-7 record. Dayton finished a distant 12 points behind league champion Muskegon. Here's an unusual stat: the Gems scored the same amount of goals as they allowed that season--263. The offense finished third overall in the league. Moore's bunch were led by Barry Merrell, who scored 28 goals to go with 73 points. Clem Trembley was right behind him, with 68 points and a team-high 39 goals. Three other players had at least 20 goals on the year and six had at least 10. The Gems defense allowed the third-highest in the league, trailing only Toledo and Port Huron. Dayton used two goaltenders that season. Michel Dumas played the majority of the games for the Gems, getting into 49 games with a 3.56 GAA. Veteran netminder Pat Rupp made it into 27 games with a 3.78 GAA. The Gems qualified for the playoffs for the sixth straight season. Gerry Moore's bunch faced the second-year Flint Generals in Round One. The best-of-seven series went the limit, but the Gems advanced to the round robin second round. This unusual playoff format saw the Gems, Port Huron Flags and Des Moines Oak Leafs face each other in a best-of-three format. The Gems were eliminated after dropping two games to Des Moines. The Oak Leafs then fell to the upstart Flags in six games in the Turner Cup Finals. I have three programs from this season, two of them have drawings similar to this. This cover drawing was created by Jerry Dowling, a long-time cartoonist for the Cincinnati Enquirer. Very nicely done! This program is 35 pages long, all black-and-white. Local advertisements include Schoenling Beer ("Cincinnati's Finest! "), The Brown Derby Seafood Restaurant and Parkmoor Dixie Fried Chicken. There are also pictures of the Gems' Turner Cup victory over Port Huron. Aftermath: Gerry Moore would stick around for another season before moving on to the CHL's Oklahoma City Blazers. After one year in Indianapolis of the WHA, Moore would return to the IHL as head coach of the woeful Muskegon Mohawks in 1978. The Gems would continue to be a strong team for several years, winning another Turner Cup in 1975-76. However, declining attendance due to the struggling local economy forced the Gems to suspend operations a year later. The franchise would be revived for the 1979-80 season, but would fold after one season, a last-place finish. Dayton would later be home to the ECHL's Dayton Bombers, then the CHL's Dayton Gems. After the CHL Gems folded, the Federal Hockey League's Dayton Demonz began play at Hara Arena, winning that league's championship in 2013-14.